Over the years, our jars and containers (an original jar above) may have changed, but the reliability and quality of Unker's powerful pain relief formula always stayed the same. The original formula for Unkers Multi-Purpose Therapeutic Salve goes back to the early 1900s. 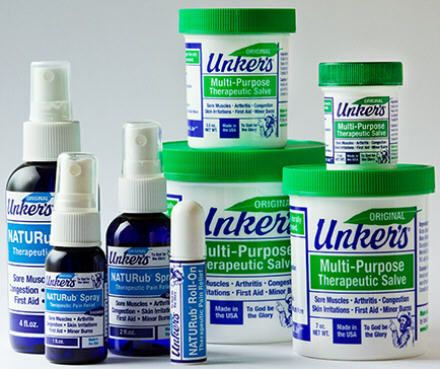 Originally sold door-to-door to the Amish and others in the Midwestern farming communities, Unkers has now become a mainstay in the medicine cabinets of countless households across the United States and throughout the world. Now in its second generation of family ownership, Unkers remains a family business, committed to its founding values of highest quality, trust, integrity, family well-being and service to God. "To God Be the Glory" is the principal foundation of our company and our mission statement. We proudly display this belief on each product, package, literature, and company logo. These are our core values. However, what makes Unkers truly unique is the fact we "handcraft" all of our products right here in the U.S.A, using all natural botanical oils purchased from American suppliers. Customers all over the world trust Unker's as a safe alternative to other chemically enhanced products on the market. Our products aid the body's natural healing process, ease the pain from a multitude of aches, pains, sore muscles and joints, and other ailments and are safe for adults, children and animals. Why buy a number of products each treating only one symptom, when one product, Unkers, will treat so many, so effectively? Unkers is truly Your Medicine Cabinet In a Jar" but, we could just as easily have called it Your Medicine Cabinet in a backpack, glove compartment, purse, gym bag, boat, camper or first aid kit. You may not realize it, but when you are holding any Unkers Multi-Purpose Therapeutic product, you are holding a piece of American history in your hands. Adults and Children 2 years of age and older: Apply to the affected area not more than 3 to 4 times daily. Children under the age of 2, should use with caution. * Arthritis: Sore Aching Muscles and Joints. Gently rub a liberal amount into the effected areas as needed for comfort. One of the mysteries of Unker's Medicated Salve is how it cools when applied to a burn, but when applied to sore muscles and arthritis, it heats up and soothes. 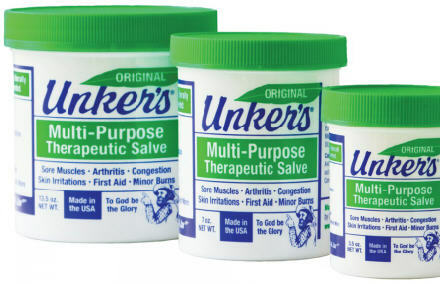 * Cuts - Abrasions - Bruises: Unker's speeds up the healing process. It is safe to apply the salve to cuts to help stop the bleeding. Don't suffer the pain of paper cuts or torn finger nails again. * Throat Congestion: Apply a generous amount of Unker's to your chest, throat and back. Cover with a warm cloth for sleep-able relief. * Sinus - Head Colds: Apply the salve to sinus areas around the nose, on forehead and behind the ears to help open clogged sinuses and relieve related symptoms. * Dry Cracked Hands and Feet - Psoriasis: Many people report that Unker's has cleared up cracked and bleeding hands and feet. Relief begins with the first application and continued use helps prevent re-occurrence. Simply rub Unker's into the effected areas. * Ear Aches: Place a small amount of Unker's on a Q-tip and gently swab inside the ear canal. Also apply a small amount behind the ear. Many customers report near instant relief. * Just to Feel Good: Fill bath tub with hot or warm water. Rub a thin coating of Unker's Medicated Salve over your entire body staying away from private parts and eyes. Soak in the tub and enjoy the pleasant tingling sensation clear to the bone. Your water will feel like it is getting colder but, it's not. Actually, your body heat is dropping. When you get out you will feel cold and begin to shiver for a short time. Wrap up in a warm towel or robe and you'll soon feel great. This is very helpful to those who suffer from arthritis. Your Medicine Cabinet In A Jar. It truly is the natural wonder salve for all aches and pains, joint and muscle soreness as well as a number of other ailments from burns and bruises to coughs, colds, sore throat and flu. Its our oldest and best known product, and is available in a wide range of size containers. Pharmaceutical Grade Snow White Petrolatum, Eucalyptus, Wintergreen, Menthol Crystals, Pine Needle Oil and Camphor. NATURub® is the highly concentrated liquid version of the Original Unker's famous salve product. This greaseless liquid formula is concentrated with all natural essential oils and is ideal for muscle pain as it begins to absorb into the skin immediately. Non-greasy, non-staining. Its perfect for car, purse, office or gym bag. Eucalyptus Oil, Wintergreen Oil, Menthol Crystals, Pine Needle Oil and Camphor.